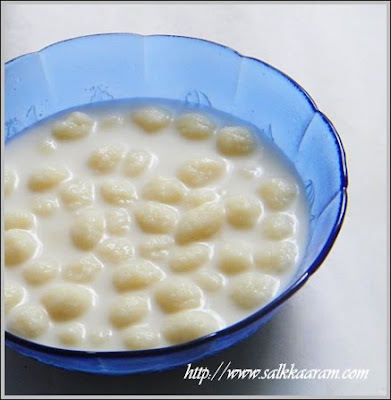 Manipputtu / Steamed Rice Dumplings In Coconut Milk | Simple and Delicious ! 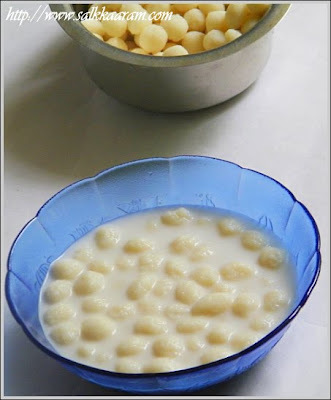 Mom was thinking of a delicious sweet from her childhood, a dessert made with rice dumplings, called paaliyappam.Making Manipputtu was the first stage, which we loved than the paaliyappam. Pour this to rice powder. Mix and when warm, make dough with that. (You can do this as we do for making idiyappams / noolputtu). Make small balls with that, apply little oil on palms if needed while making. Steam them in a idli vessel. Take thick coconut milk from the fresh grated coconut. Add crushed cardamoms to it. Pour the steamed rice dumplings directily to the coconut milk. Let it soak in the coconut-milk. Later serve in small bowls with spoons. Hi Seena.. once again I'm back. This is sooooo cute... :-), I would try out this one day and let you know. And dopost some paneer dishes.. I had requested it before as well. This looks so cute! Like tiny rasmalai's :) I have never had this! Looks delicious! Thank you for the Mani Puttu. In my childhood I never asked for any other treat.